In Famine, Peanut Butter-Based Food Rides To The Rescue : Shots - Health News The United Nations is starting to airlift emergency food to Mogadishu, Somalia. The first round of relief supplies should be enough to feed 3,500 malnourished children for a month, one official said. The World Food Program is starting to airlift food to relieve the famine in the Somali capital of Mogadishu. The first plane, carrying 10 tons of food supplies, will help feed 3,500 malnourished children for a month, a spokeswoman said yesterday. The World Food Program is airlifting Supplementary Plumpy to Mogadishu. Shots wondered what this emergency food was like. For an answer, we turned to Lynnda Kiess, a nutrition adviser at the United Nations program's headquarters in Rome. The food being is a peanut-based paste called Plumpy'Sup or Supplementary Plumpy. "It looks just like peanut butter," Kiess says. It's a peanut-based product that contains whey, soy, sugar, minerals and vitamins. But it's not the kind of thing you'd find at Whole Foods next to Nutella. 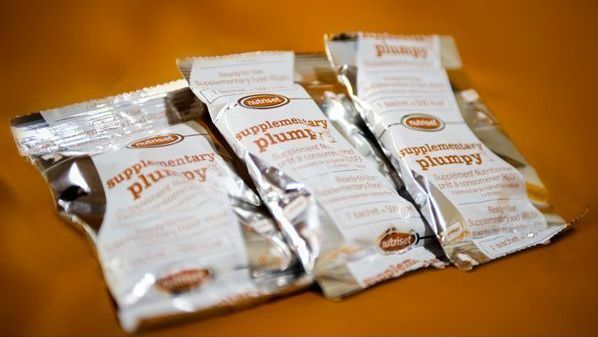 University of Alabama at Birmingham professor emeritus of public health Dr. Frank A. Franklin says Plumpy'Sup hits the top needs of malnourished people: calories, high-quality protein, and a mix of minerals and vitamins. Plus, it's sweet, so kids will eat it. Long shelf life is another important factor. The special foods are low in moisture and oil-based, so they're not hospitable to bacteria. The packages are also easy to transport. In the early stages of an emergency, the World Food Program distributes one-month supplies per child. The food doesn't require cooking and is easy to serve. A mom can tear a corner of the packet and feed it to her child right from the package. Each packet is about 500 calories. For 10-month olds, that's enough energy, Kiess says. But older kids will need additional food. It typically takes kids who eat the special food 45 to 90 days to meet nutritional goals, she says. This shipment isn't expected to be the last. According to the United Nations, 80 more tons of food aid will be taken to Mogadishu in the next few weeks and 20 tons will be sent to the south of the country.